Chris White has been the County Councillor for St Albans Central since 1993, and since 2008 has served as the District Councillor for Clarence Ward. He originally trained as an accountant and, over the years he has been involved in local politics, has served as a member of the Police Authority and the Audit Commission. He lives in St Albans with his wife. As a County Councillor, Chris takes a particularly keen interest in the state of our highways - and has consistently highlighted the failings of the County Council to provide a decent repairs service. On a more local level, Chris is working with local people to find a way of refurbishing the Clarence Park cricket pavilion and is pressing the district council to keep the streets free of rubbish. Caroline has lived in Fleetville for more than seven years with her husband Adam and their three daughters, all of whom attend the local infant and junior schools. Caroline works locally as a childminder and is also a part time primary school teacher. She has a PhD in Russian history and is the author of Moscow: A Cultural and Literary History. Over the time that she has lived in St Albans, Caroline has become involved with a range of local campaigns: she has helped to organise street parties on her road and lobbied for improvements to the Fleetville playground. She is a keen supporter of the Playing Out initiative, which aims to promote a sense of community and to encourage children to be more physically active. She is on the Committee of the Fleetville Junior School PTA and she served as a school governor in London for eight years. She is a volunteer for the Friends of the Earth anti-idling campaign, a member of the St Albans Cycling Campaign and she supports the aims of Sustainable St Albans. 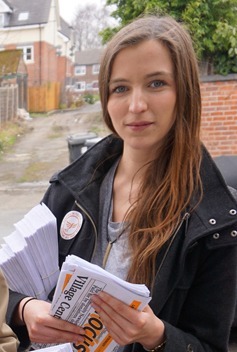 Caroline was an active member of the Stronger In campaign during the EU referendum in 2016. Caroline conducts the local a cappella choir, Fleetville Harmony, which performs at local events and supports charities including Earthworks, the Ollie Foundation and the Fleetville Community Centre New Build Project. Ellie was elected in the Clarence ward by-election on 20 October 2016. Ellie has lived in St Albans nearly all of her life, having attended Beaumont School. She currently works in the ward on Hatfield Road for as Public Affairs and Policy Officer for CAMRA and spends her day job protecting many of St Albans's historic pubs from developers. She works closely with Chris and Gerard in trying to sort out the wards broken roads and pavements as well as protecting Clarence Park and ensurng the ramp is repaired adequately.